Benton Harbor is the poorest city in Michigan. Ninety (90%) percent of the people live below the poverty level and seventy (70%) percent are unemployed. Almost all of the citizens are black. The land is very valuable real estate. Whirlpool, already dominant in the area, wanted much of this land for a small price. It needed approval of six (6) of its commissioners. BANCO (the Black Autonomy Network Community Organization), led by Rev. Pinkney , succeeded in a recall election of a key commissioner. A suit was brought to set aside the election alleging fraud. Without sufficient evidence Judge Paul Maloney (who has been nominated by President Bush to the federal bench in the Western District) set aside the recall election and scheduled a new one. With serious money from local political forces the recall was defeated and the commissioner retained. Thus, the sale went through. Whirlpool detached the property from the City of Benton Harbor and attached it to mostly white Benton Township. It plans to build a $100,000,000 gated community, marina and Jack Nicklaus – designed golf course. Seeing Pinkney as a danger, corrupt politicians cooperated with the Prosecutor to produce bribed and coerced witnesses to say that Pinkney had improperly handled absentee ballots and had bought votes (people were paid $10 to say Pinkney paid them $5). Pinkney went to trial in the spring of 2006. There were two minorities on that jury. The trial ended in a hung jury. He is to be tried again. January 25, 2007, you could feel the tension in the Berrien County Courtroom of Judge Alfred Butzbaugh as friends and activists of Rev. 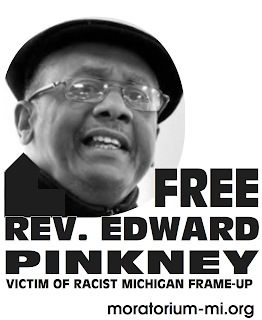 Edward Pinkney from across the nation gathered for a hearing in his support. The hearing was to argue two motions. One motion to argue the constitutionality of the Michigan Absentee Voter statute, which makes it a 5 year felony to possess without knowledge or bad intent, an absentee ballot, but only a misdemeanor to actually buy a vote. The second motion was to challenge the racial composition of the juries in Berrien County where, although blacks are 15.5% of the population, rarely is more than 1 in 30 potential jurors black. Rev. Pinkney's legal counsel, Attorney Timothy Holloway presented argument for the first motion. He argued that statutes that involve a malum prohibitum crime were not criminal at common law. The person had to have knowledge that it was illegal to handle the absentee ballots. The prosecution, Aaron J. Mead and Gerald L. Vigansky, argued back that one only had to have knowledge that they possessed an absentee ballot belonging to someone else. They argued that the Legislature wanted criminal intent to be an element of a criminal offense. They compared the handling of an absentee ballot and being charged with a felony as the same as someone that drove their pick-up truck across state line with possession of a gun, who is stopped and prosecuted for carrying a concealed weapon. The prosecution argued that everyone knows it is illegal to possess a concealed weapon without a permit and argued that possession of an absentee ballot falls under the same interpretation. Attorney Holloway cited the Michigan Supreme Court case People v Osborn (1912) as well as several other cases that ruled a guilty mind was necessary in order to prosecute. Judge Butzbaugh said he would try to have a ruling within two weeks. Attorney Elliot Hall came to present argument for the motion challenging jury composition. In the motion, he asked that the court move to discovery in the selection of juries for the circuit court in Berrien County and striking the selection procedure as discriminatory and exclusionary with regard to minority jurors and delay Rev. 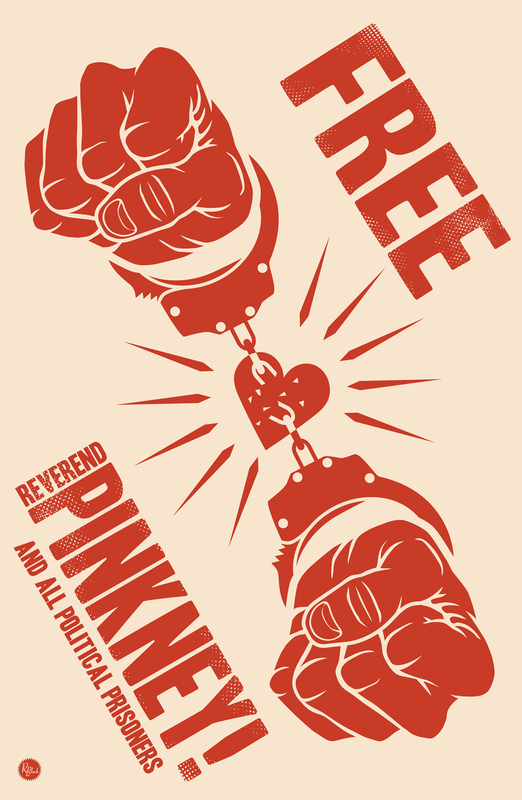 Pinkney's trial until the system can be reformed and provide him with a non-discriminatory list of jurors called to serve. The prosecution, however, did not respond to this motion in writing before the hearing telling the judge that he thought that discovery would be done while the attorneys were present. The judge then told Attorney Hall to gather the material from the clerk and ordered a continuance. Then Judge Butzbaugh called for both the prosecution and defense attorneys to join him in his chambers. While in chambers it is my understanding that the judge informed the parties that going through the discovery process on jury selection would not delay the trial. Attorney Elliot Hall responded that – we would see about that. Afterward, Rev. Pinkney said "We gave them a spanking today!" He was confident of his attorneys handling of the motions, stating that we will go to Federal court if we have to appeal these motions. The prosecution presented arguments to the malum prohibitum issue that didn't hold water for the audience in attendance. Many felt it was ridiculous to compare the handling of guns with the handling of ballots. It was an eye opening experience of a judges going through with a hearing when the prosecution hadn't followed through with a written response to the defense. Those who have continued to observe the court in operation felt that the judge was trying to appear to be listening to both sides by asking for further clarification. However, information about Judge Butzbaugh's comment about the jury composition motion not having to be answered before trial blew that perception out of the water.